According to the company, Milo is a "socially advanced" robot who "never gets tired, never gets frustrated, and is always consistent." The district has spent about $10,000 on the robot along with related curriculum and professional development for its special education teachers. 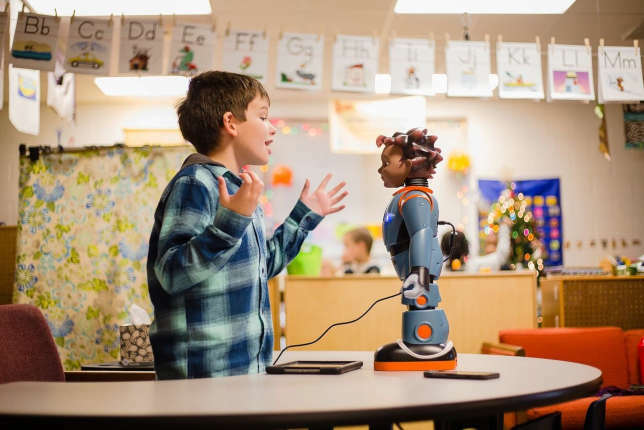 The idea behind RoboKind's Robots4Autism program is to help students with autism spectrum disorder learn how to tune into emotions, practice empathy and act more appropriately in social situations. Milo, who has the ability to show various expressions, delivers his lessons verbally. As he speaks, a chest screen shows various symbols to help the student understand what is being said. Milo also directs the kids, who are sitting with their special education instructor, to watch brief video clips on their tablets, which demonstrate the skills they're working on. The learners are asked by Milo to say whether the person in the video is doing the action correctly. Reporting in the Moberly Monitor-Index quoted district Director of Special Services, Erin Oligschlaeger, calling Milo "the future of education and socialization for learners with autism." Already, the story stated, the teachers have seen how Milo has helped their students with their social interactions. "He is engaging and the students are excited to work with him," said special education teacher Megyn Martin.